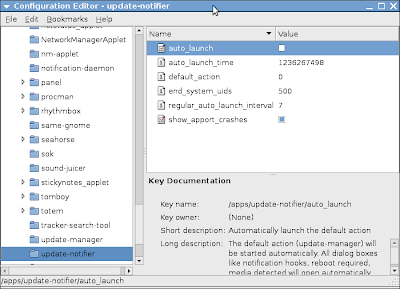 Since I moved to Ubuntu 9.04, jaunty jalopnik (or something like that, to lazy to check), I lost automatic updates. Even I had all settings set so I wanted to check for updates daily, and be notified when new updates were available, it was not working; the system was not doing the automatic fetch of new updates, so I was doing manual updates. But that finished yesterday, when I looked into the issue. To make it short: the problem is that the automatic updates procedure does not run on a daily basis, not that the notification icon that I liked very much on ubuntu 8.04 was not appearing. To solve that, I noticed that in /etc/cron.daily there was a script called apt, which is the one to make the daily updates, so that was fine. Now I have daily updates back! Now the problem that I'm facing is that when new updates are available, update manager starts automatically showing the update manager screen, instead of just the notification icon. I think I read about this issue somewhere, and a gconf setting needs to be set to solve this problem. I'll update this post once I solve this last nuisance. update: at http://www.watchingthenet.com/how-to-restore-automatic-update-notification-icon-in-ubuntu-9-04.html i found the solution to restore update manager notification icon: open geconf-editor (in a terminal type 'gconf-editor &') and unselect the key '/apps/update-notifier/auto_launch' See the screenshot below! I'm glad it also worked for you!! THANK YOU!!!! I've been looking for a solution for a long time! Thanks for pointing this out. The permissions on the apt script where wrong in my case also. Corrected it so let's hope it solved the problem at my end too.